Elm Awards honor individuals and organizations from the city, and Ivy Awards go to those from the university. 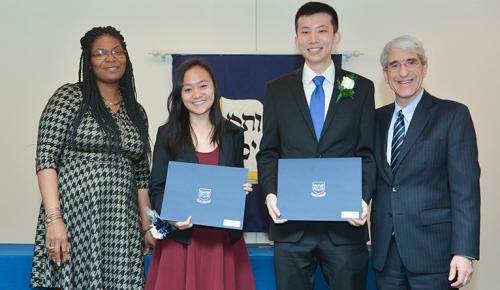 Yale President Peter Salovey and Board of Alders President Tyisha Walker-Myers presented this year’s awards. This year New Haven Code Haven was awarded an Undergraduate Ivy Award. Annie Chen and Dennis Duan accepted the Undergraduate Ivy Award on behalf of their organization Code Haven. To read a complete list of individuals and organizations honored you can read the Yale News article at https://news.yale.edu/2018/04/27/seton-elm-ivy-awards-awarded-people-and-groups-connecting-town-and-gown.